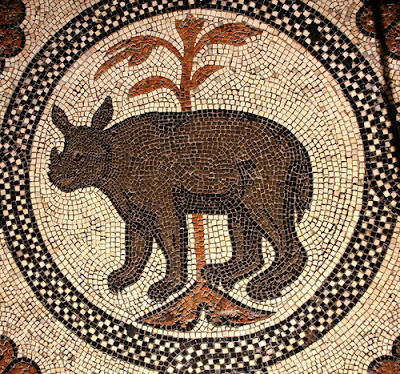 (Venice, Italy) Both Venice and the Rhinoceros are endangered species, ravenously desired and unthinkingly consumed by a proliferating consumer class. 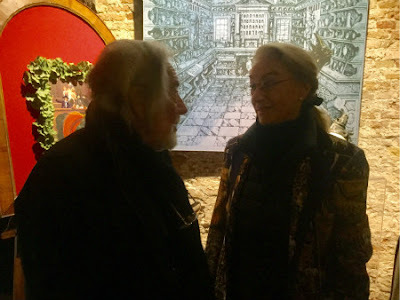 That was the gist of the symposium on November 24th at Palazzo Contarini Polignac entitled Beauty and the Beast: Venice and the Rhino. The rhinoceros has walked the earth for more than 50 million years, and is the world's oldest living mammal. Its horn has become one of the most costly luxury items on the planet -- a rhino is killed every eight hours to satisfy demand. The rhino horn has been used in traditional Chinese medicine for millennia, but increasingly it is being used as a status symbol to display success and wealth. Humans have projected all sorts of miraculous attributes onto the rhino horn, just as humans have projected all sorts of fantasies onto the city of Venice. According to legend, Venice was founded on March 25, 421 A.D., nearly 1,600 years ago. Its monumental churches and impressive palaces still stand after centuries, nestled inside the lagoon. Nowadays, each day an average of 60,000 tourists descend upon a city composed of 54,000 residents. Both the rhino and Venice are in danger of becoming extinct. Catherine Kovesi of Emporium is a historian of early modern Italian history at the University of Melbourne and was the organiser and curator of Venice and the Rhino, which kicked off with Bikem de Montebello, the Managing Director of Palazzo Contarini Polignac, giving us a fascinating history of the palace. 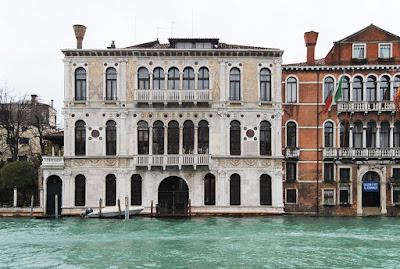 In 1900, American-born Winnaretta Singer (1865-1943), heiress to the Singer sewing machine fortune, bought the 15th-century palace on the Grand Canal as a birthday gift for her husband, Prince Edmond de Polignac, a composer of music, who died shortly thereafter. Winnaretta was a great patron of the arts, and Palazzo Polignac was the center of her extraordinary contributions to the cultural life of Venice, a city both she and Edmond cherished. 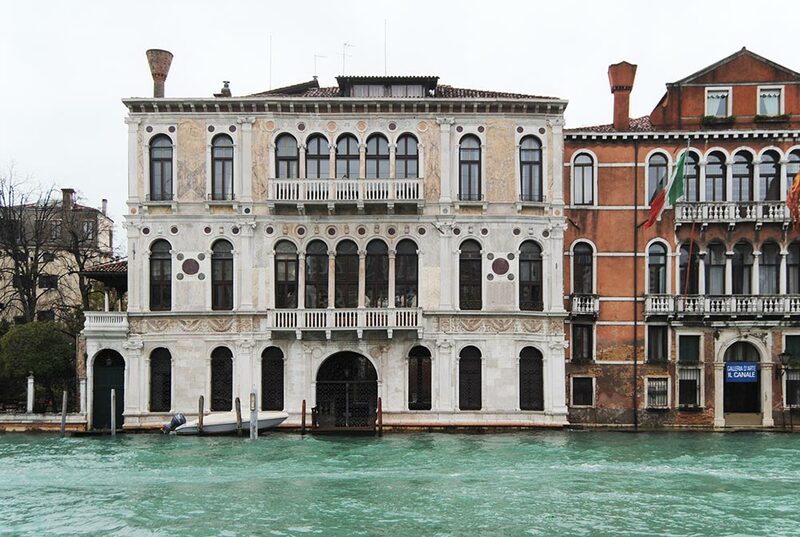 Today, thanks to the efforts of the de Montebello family, Palazzo Contarini Polignac remains a vibrant center of Venice's cultural life. Catherine Kovesi's focus is on debates surrounding luxury consumption in the early modern world, and is a lover of Venice herself. One day, while wandering around the city, she stumbled upon Mirabilia, the art studio of Gigi Bon, an artist who feels closer to the rhinoceros than to people. In fact, Gigi's rhino sculptures so riveted Catherine that they inspired the symposium itself. In 2017, worldwide luxury retail sales totaled 1.2 trillion euro. Personal luxury goods -- the core of the market -- have grown 191% since 1995. Catherine took us on a journey that started with the long history of the word "luxury" compared to the word "magnificent." Centuries ago, luxury was a vice, not a virtue, and meant "excess" and was used to describe people who overly indulged; luxuria meant "lust," and was a sin linked to women. By the Elizabethan period the word was associated with adultery. Magnificence, on the other hand, described the elite who spent on a large scale for the greater good, which was expected of members of the aristocracy. Speaker Lynn Johnson, Founding Director of Nature Needs More said, "Follow the money." There are more than 150 churches in Venice. Venetians did not need another church, yet they built magnificent houses of worship and enhanced them with precious works of art. The pursuit of luxury was practiced by the mediocre and those with vain ambition. The magnificent believed true success is what you left to the world. One of a kind: Clara the rhinoceros in 18th-century Venice and the tale of a missing horn was a pre-recorded video presentation by Glynis Ridley of the University of Louisville, who, unfortunately, could not make it to Venice. In 1741, a Dutch sea captain named Douwemout Van der Meer obtained a female Indian rhino calf named Clara, whose mother had been killed by hunters. When Clara was a month old, she had been adopted by Jan Albert Sichterman, the director of the Dutch East India Company, and grew up wandering around his property, becoming quite tame. Sichterman either sold or gifted Van der Meer with Clara, who took her on a grand European tour where she became a sensation, appearing before emperors and kings. 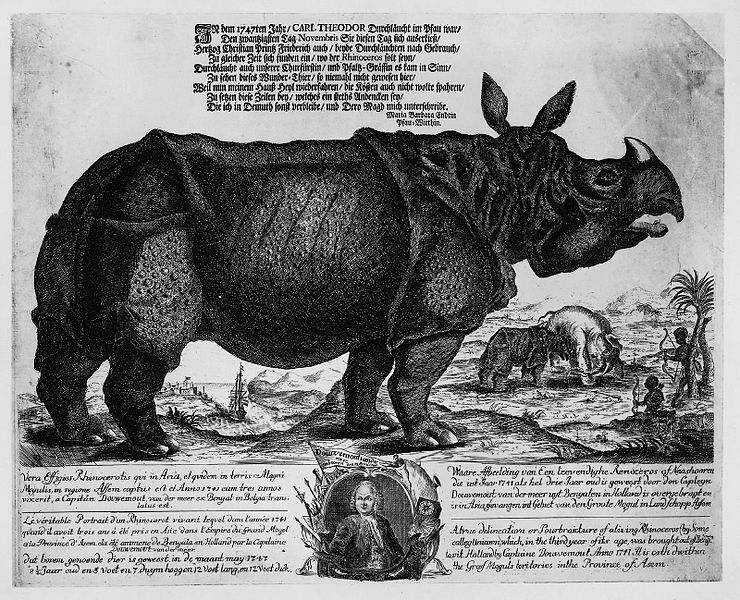 She was only the fifth rhino seen on European soil since the fall of the Roman empire. In 1751, en route to Venice for an appearance at Carnevale, she shed her horn, captured in the painting of Pietro Longhi (photo at the top). 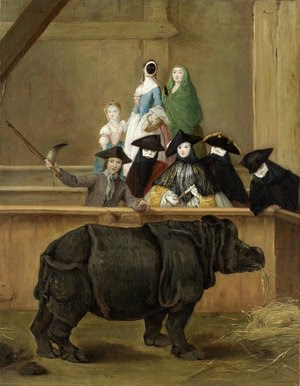 Glynis Ridley was a winner of the Institute of Historical Research Prize for figuring out just who the heck that rhino was at the 1751 Venice Carnival. 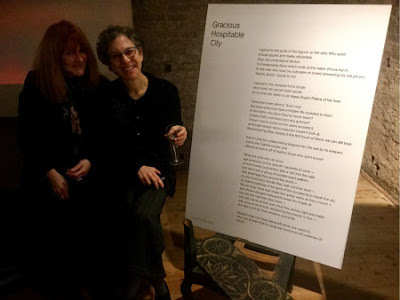 The symposium brought together an international group of scholars, artists, poets and writers, who explored the intersections between Venice and the rhino. Other speakers included Jane Da Mosto, an environmental scientist and Executive Director of We Are Here Venice, whose topic was Venice: A Fragile and Resilient City; Sophie Bostock of the Orientalist Museum in Qatar, who spoke about Clara in Qatar: The story of a Meissen porcelain; Bruno Martinho of the European University Institute, whose topic was Rhino horns and scraps of unicorn: The sense of touch and the consumption of rhino horns in early modern Iberia; and Sabrina Ardizzoni of the University of Bologna who presented the Taiwanese sculptor Shih Li-Jen: His Oeuvre, and his vision of the rhino and unfettered consumption. 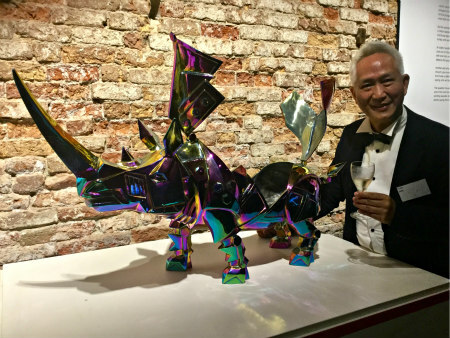 Shih Li-Jen said, "My goal is creating rhino sculptures to inspire people to help save these creatures." "There are wild elephants in the country, and numerous unicorns, which are very nearly as big. They have hair like that of a buffalo, feet like those of an elephant, and a horn in the middle of the forehead, which is black and very thick... 'Tis a passing ugly beast to look upon, and is not in the least like that which our stories tell of it being of as being caught in the lap of a virgin; in fact, 'tis altogether different from what we fancied." To Fondamente Nove which ends at the water: throw me in. "Mama, dimmi." Speak to me. so no one can make a Las Vegas Doge's Palace of her love. "Everyone loves Venice." And I nod. in the mirror of a place they've never been? A place that's cherished and also grieved? as though beauty were a wound I couldn't look at. Remembering Rilke, beauty is the first touch of terror we can still bear. offered as a knock-off of itself to those who don't know? or restore paintings in the back of Accademia to repair the sky. and lean out their tired windows and smile. Respect does not mean being left alone, but cared for. Who can answer that in a language everyone will understand? The symposium stressed that a new conversation is needed. That the Academy needs to talk to industry. That the Academy needs to talk to conservationists. That the conversation needs to move away from battling the feeders of consumer demand towards understanding consumer motives. That creating empathy in consumers is probably a losing battle. That conservationists need a new paradigm. Afterwards, there was a Vernissage for Rhinoceros: Luxury's Fragile Frontier in the Magazzino Gallery, Palazzo Contarini Polignac's exhibition space, featuring the art of Gigi Bon and Shih Li-Jen, and the poetry of Ronna Bloom, which is open to the public until December 21, 2018. I haven't spent such an enlightening and educational day in a long time, surrounded by intelligent, thoughtful and magnificent people. Venice needs more symposiums like this. Kudos to Catherine Kovesi and Bikem de Montebello for organizing the event, and thank you to all the speakers for imparting their gems of wisdom. Both Venice and the Rhinoceros are endangered species, ravenously desired and unthinkingly consumed by a proliferating consumer class. 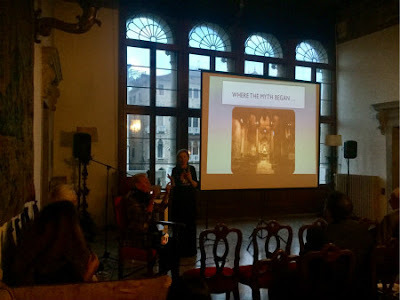 That was the gist of the symposium on November 24th at Palazzo Contarini Polignac entitled Beauty and the Beast: Venice and the Rhino.